It's only weeks since I reviewed the first 7" released by Donna Blue (read on here: http://wonomagazine.blogspot.com/2018/08/donna-blue-donna-blue.html) and here's a new single already. Things get clear fast: Donna Blue is about ready for its first full length album. In the descriptions of the band its love of French Yeah Yeah pop or in Dutch "zuchtmeisjes" (sigh girls) is stressed, something that, at least I did not directly associate with the pop played by Donna Blue on its 7". On its new single there simply is no doubt left. Next to singing in French, the whole atmosphere is no longer just wallowing in pre-psychedelic sixties girl pop it is French Yeah Yeah from start to finish. Except for the crisp, clear sound there is nothing 10s about this record. "Where going back to the sound of the (French) nation, it's a flashback", 1964-65. Just to use this old Radio Veronica jingle for once. 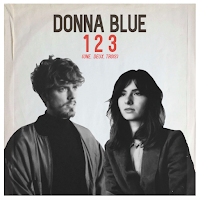 1, 2, 3 is also Donna Blue's most direct, released, song to date. It starts off with a firm drums pick up and the guitar jumping in playing dark, muted bass notes. Things continue to be just as firm. All 2.13 minutes. Danique van Kesteren sings solo and wholly clear and extremely dedicated. Words are spat out when and where necessary. No beating around the bush. A lovely pop song. For over 40 years I associated French singing by a Dutch band with 'Mon Amour' and BZN. Those days are finally over. From now on I have 1, 2, 3 to refer to and think of. Life has just been made a little better today. Thank you, Donna Blue.